So where exactly is Elachbutting Rock? Most West Aussies I've mentioned it to have never heard of it, which is a good sign if you're looking for somewhere uncrowded and unexploited. 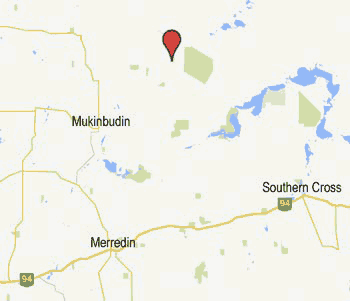 The main reason for obscurity is its location about 70 km northeast of Mukinbudin, or about an hour north of Westonia which is near the midpoint of the highway between Perth and Kalgoorlie. It's a bit out of the way, and not on the way to anywhere ... unlike Wave Rock which is near a town on the main route between Perth and Esperance. If you do make the trek to Elachbutting Rock, most likely through the small town of Mukinbudin, most of the journey is on sealed roads. The last section is on gravel which is of good quality when dry (the norm in this part of the world) but can become a little slippery after good winter rains. Beringbooding Rock is nearby, so for your efforts you can see two monoliths for the price of one. A narrow gravel six kilometre long road encircles the rock. On the far side is a camping ground and a walking route to the top, but the wave-like rock is on the side where you first enter the reserve, adjacent to Monty's Pass and King's Cave. The contrast is striking. At Wave Rock you have a visitors' centre, coach tours, paid parking and sealed roads and paths to handle the tourist traffic. Here at Elachbutting Rock you park on a patch of gravel cleared from undisturbed bush and wander a quiet trail, probably with few other people, if any. 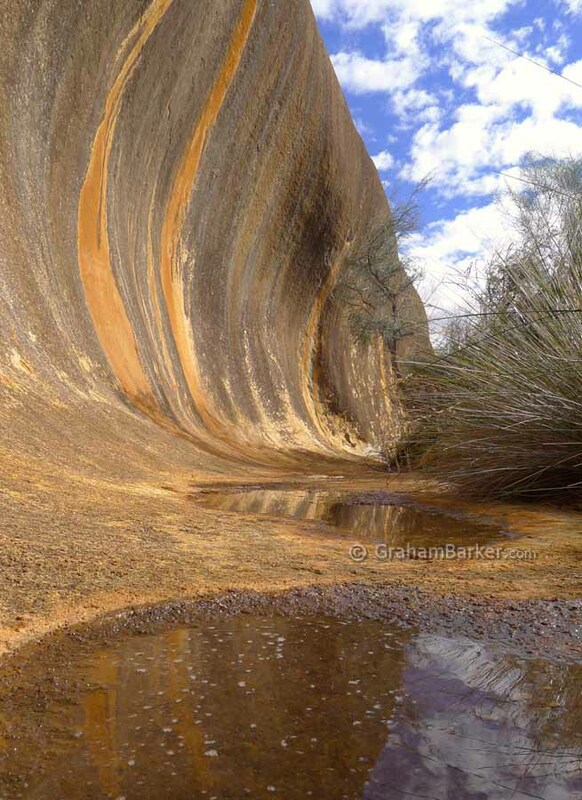 The wave-shaped section of rock is not as high or long as the famous Wave Rock, and views are not as expansive since the vegetation grows closer to it. Yet it is still very well formed, substantial and photogenic. And you'll most likely get to enjoy it in peace and quiet. Right next door to the wave section is Monty's Pass, a narrow cave which can be walked through from one end to the other, about thirty metres. It is the result of a huge chunk of Elachbutting Rock's outer layer (think of the layers of an onion) dislodging and sliding, leaving a gap between the rock and part of its outer shell. If the day is warm and flies are annoying, the shade of this cave can be a pleasant refuge and lunch spot ... but only if there is no people traffic, because there isn't much room. The other end of Monty's Pass leads to King's Cave. As a cave it can appear underwhelming - it would be better described as a hollow or an overhang - but is said to provide good echoes. 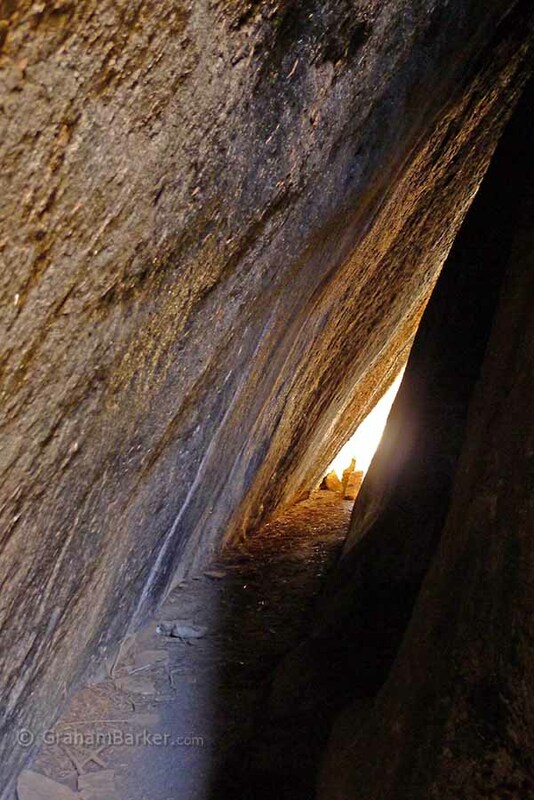 Other indentations can be found by exploring the sides of this big monolith which has hardly changed in the thousands of generations that Aboriginal people have been coming here. 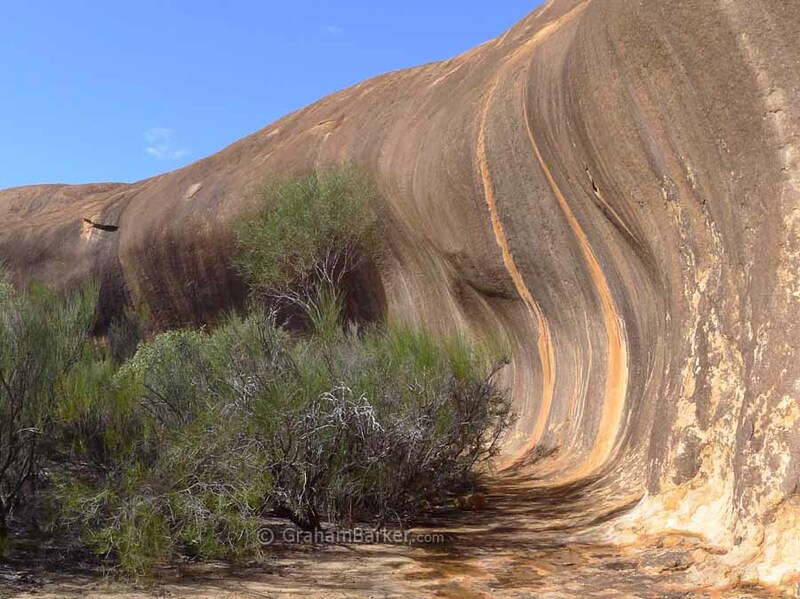 Elachbutting Rock may be a little out of the way, but is a different experience to that of Wave Rock, in spite of some visual similarities. 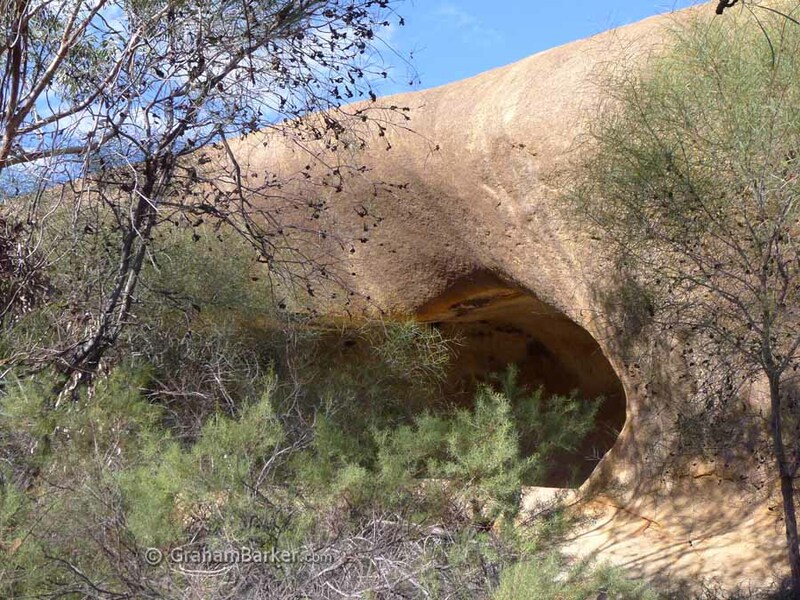 It can easily be combined with a visit to nearby Beringbooding Rock, and if you don't fancy retracing steps through Mukinbudin, returning South via Westonia can make a pleasant "remote wheat belt" loop drive.